This is a heart-warming story of a father and his unconditional love towards his son Fisher. This book will teleport you to a world filled with love, understanding acceptance great adventures and redemption. What I loved the most was how Paul invited everyone to be more open minded towards the unknown, not to be discriminative and treat his next as equal regardless of his race, religion and condition be it physical or mental. It takes a lot of courage to stand by the things you believe in and protect the people you love with all you’ve got, here we see exactly this. Children being mocked and bullied, simply because they are different from the rest of us. Because they have autism, like this is some kind of a contagious disease that needs to be avoided at all costs. It is a great testimony of how people with autism cope on a daily basis in a world where the author gave them a voice an opportunity to express themselves and do extraordinary things despite the difficulties they might have, portrayed as normal kids that just like everybody else need to be loved, understood and listened to. Fisher, don’t ever be afraid to think for yourself and do what is right” he said. ”It’s easy to do what is popular, but sometimes it takes guts to do what is right. I’m a widower and the lucky dad of an amazing autistic son. He’s inspired me to write YA Fantasy Autism Fiction. 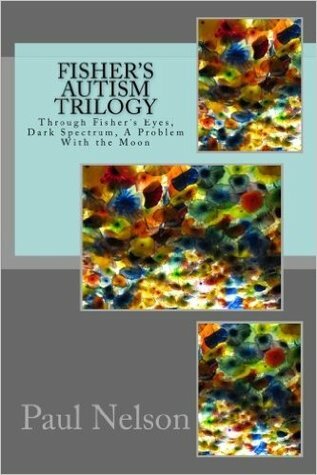 (THROUGH FISHER’S EYES: An Autism Adventure, DARK SPECTRUM, and A PROBLEM WITH THE MOON…They are available individually and as a set in one volume called FISHER’S AUTISM TRILOGY.) My books are a labor of love, and I hope to teach a bit about how it feels to be autistic, and to also encourage tolerance and acceptance. A big thank you to Booktasters, Paul and Michael for the opportunity! Wow! This is quite a long book– but it’s three novels put together, right? I love that Paul C Nelson identifies as writing autism fiction. That’s important! We need more #OwnVoices authors. Where did you find this book to begin with?